James’ Panatrope "Cortez" fully opened. I recently acquired a Brunswick Panatrope "Cortez" Phonograph. I decided to buy it because it’s the prototype of my Victrola Orthophonic "Credenza", and it’s also a pretty impressive piece of furniture. The tone-arm, reproducer, turntable platter and all the hardware are either gold-plated or are of solid brass. When I got home, I was anxious to see if the motor was complete, because it came without a winding crank. I was surprised to find an electric-driven motor inside with a rotor and the traditional regulator to control the speed. Now I know the reason that it came without a crank, though it has a crank escutcheon on one side. I brought the motor to Paul Rosen, who has been servicing my vintage radios since the 1990s. The electric motor is General Electric, model 27286, and it runs on 25 to 40 cycles. These days, our electricity is delivered at 60 cycles and 110-120 volts. So, the regulator then had to be adjusted to slow down the turntable speed. Because current-day receptacle voltage is 110-120 volts, a transformer was needed and was set at 105 volts so the motor does not over-heat, thus prolonging the life of the motor. New wiring was updated to the present standard. I found out that in 1925 the Brunswick-Balke-Collender Corporation teamed up with the General Electric Company and manufactured the all-electric phonograph. * Don Whalen, one of the General Electric engineers, gave it the name "Panatrope". ** In mid 1926, the Brunswick Corporation introduced the Panatrope acoustic models in the U.S.A., six months after it had introduced the electric models. There was a fierce competition between Brunswick and Victor, on which could launch an all-electric phonograph first. Some authorities say that Victor was first, while others say it was Brunswick. My Brunswick Panatrope "Cortez" was made to compete with the Victor Victrola "Credenza". It is also interesting to note that all Brunswick acoustic Panatrope models were originally named for Spanish cities such as "Madrid", "Seville", "Cortez" and "Valencia", though Brunswick later switched to alpha-numeric names. 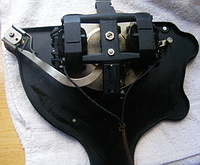 The medallion with serial number near the turntable, identifying the machine as a Brunswick exponential-horn Panatrope "Cortez"
The "Cortez" model cost US$300 new, with a hand-wound spring-motor to power the turntable. However, it was possible for buyers of most of the larger acoustic Panatrope models to make a special purchase of an electric motor, an option for US$35 extra. The "Cortez" was the largest and most costly of the Brunswick exponential-horn Panatrope models. The inside-horn is made of thin, molded holly or spruce wood, in a large sweeping design, and is very beautiful. The dimensions of the "Cortez" horn are: height 26 and 1/2 inches and the bell is 17 and 3/4 X 23 and 1/4 inches. The term "exponential" refers to the shape of the large internal horn, found in the acoustic Panatrope models. The larger the horn, the better for the passage of large bass notes, but the shape of the internal horn is not truly logarithmic in design. The "Cortez" model came with a beautifully carved walnut cabinet and the lacquer finish on all the Panatrope models gives them a remarkable lustre. 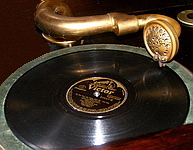 The Brunswick Panatrope models were intended to play the newly developed electrically-recorded discs, and obviously to compete with Victor Orthophonic Victrola models. 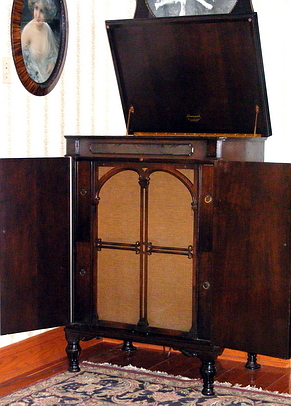 The "Cortez" is relatively rare compared to the Victor Orthophonic models, because it was discontinued in 1929, so that Brunswick could concentrate on their electronically amplified Panatrope models. Or the rarity could be because the sale of the Victor Orthophonic was very much larger, since Victor was a much more popular brand. Also, I think it is safe to further conclude that the acoustic Panatrope fitted with an electric-driven motor is even rarer, for the motor was a special purchase. James was rather surprised to find an electric motor in his acoustic Panatrope "Cortez"
When the improved exponential-model "Carmen" was introduced in Canada for $195 (TDS 1), the advertisement stated that "The Carmen fitted with electric motor is $40 extra". The spring-driven and electric-driven motors were housed in the same cabinet, which is why my "Cortez" with an electric motor has a winding-crank escutcheon at the side. If a phonograph dealer had a customer who wanted an electric motor installed, he just ordered an electric motor from Brunswick to replace the spring-driven motor, as both motors fit onto the same motor-board. 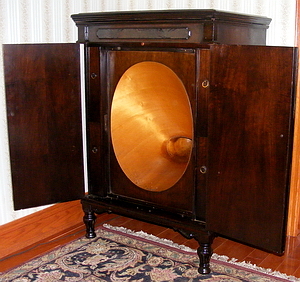 Most of the U.S. Brunswick Phonograph cabinets were made at its factories in Dubuque, Iowa, or at its factory in Muskegon, Michigan. 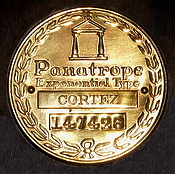 My Panatrope "Cortez" has a U.S. patent decal, though not a Canadian one. There was, however, a Brunswick Phonograph factory on Hanna Avenue in Toronto (now housing the "Academy of Spherical Arts"), and they did make most or all of the exponential-horn acoustic Panatropes. The Canadian acoustic Panatrope models were first advertised early in 1927, about six months after they were introduced in the U.S. The high-boy model "Cortez" was sold in Canada by Heintzman & Company and by Simpson’s and, at $385, was the top-of-the-line Brunswick exponential-horn acoustic machine (TDS 2). The consolette "Gerona" sold in Canada for $115, the consolette "Seville" for $155, the console "Madrid" for $235 and the console "Valencia" cost even more. In Canadian advertising, one of "Five Reasons Why the Brunswick Panatrope (Exponential Type) is the Ideal Instrument for Your Home" was number two, "The best Canadian workmanship throughout" (TDS 3), though the "Cortez" was not specifically mentioned in this advertisement. Incidentally, the all-electric Brunswick Panatrope P-13 sold for $750 in Canada and other electric models ranged up to $1700 (G 1). Therefore, it is safe to conclude that the Brunswick exponential-horn Panatropes were made in Canada, but it’s still not definitively proven that the "Cortez" was built here as well. Alternatively, it is possible that a Canadian resident went to the States, bought my machine there and transported it into Canada. Was My "Cortez" Panatrope Manufactured in Canada? There is no "Made in Canada" label on or in the machine. The decal inside the lid reads "Brunswick Panatrope - Registered U.S. Patent Office". There is a "Brunswick Balke Collender Co., USA" paper label on the underside of the motor-housing. As well, the "Induction Disc Phonograph Motor", model 27286, type AZ-133A, has a small metal plate attached, reading "General Electric Co., U.S.A.", so it is likely that the motor was manufactured by G.E. in Schenectady, New York. It is certain, however, that electric motors for the exponential Panatropes were available through the Canadian distributors. The serial number on the gold medallion near the turntable in my "Cortez" is 147,426, and there are two numbers punched into the wood by the lower frame of the doors and hidden by the grille, the serial number 147,426 and the number 2560. A friend in California has an American-made "Cortez" and his numbers are 147,789 and 2560, respectively. It was looking as if 2560 might be the model number, and that perhaps a block of serial numbers had been sent up to the Toronto Brunswick factory. R.J. Wakeman’s U.S.-made "Cortez", however, has 134,788 and 6410 stamped into the wood, so it’s not clear what the 4-digit number means. If someone has any more information on the manufacture and numbering of Brunswick acoustic Panatropes in Canada, I would be most interested to know the details. Mr. R.J. Wakeman, UC at Davis, who motivated me to write this article and for the information he conveyed, Mr. Jeff Lutton in California, PhonoLand.com for questions and answers, Mrs. Betty Pratt and Dr. Arthur E. Zimmerman, who worked so hard to establish the Canadian content, and Mr. Paul Rosen for his technical support.